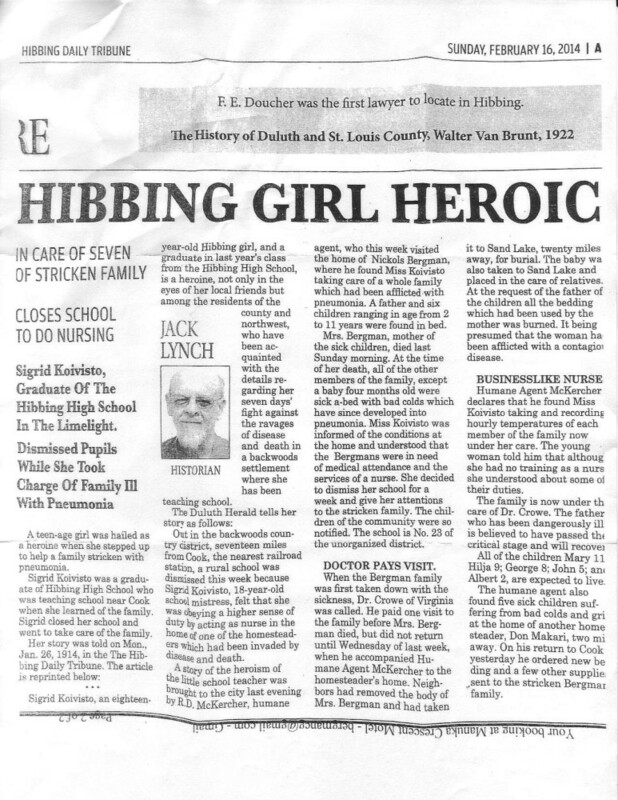 Sigrid Koivisto, Graduate of The Hibbing High School In The Limelight. Dismissed PupilsWhile She Took Charge Of Family Ill With Pneumonia A teen-age girl was hailed as a heroine when she stepped up to help a family stricken with pneumonia. 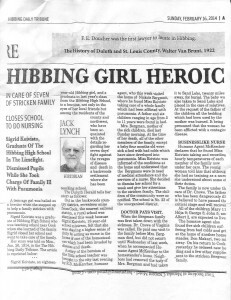 Sigrid Koivisto, an eighteen-year-old Hibbing girl, and a graduate in last year’s class from the Hibbing High School, is a heroine, not only in the eyes of her local friends but among the residents of the county and the northwest, who have been acquainted with the details regarding her seven days’ fight against the ravages of disease and death in a backwoods settlement where she has been teaching school. Out in the backwoods country district, seventeen miles from Cook, the nearest railroad station, a rural school was dismissed this week because Sigrid Koivisto, 18-year-old school mistress, felt that she was obeying a higher sense of duty by acting as nurse in the home of one of the homesteaders which had been invaded by disease and death. A story of heroism of the little school teacher was brought to the city last evening by RD. McKercher, humane agent, who this week visited the home of Nicklas Bergman, where he found Miss Koivisto taking care of a whole family which had been afflicted with pneumonia. A father and six children ranging in age from 2 to 11 years were found in bed. Mrs. Bergman, mother of the sick children, died last Sunday morning [Jan. 8, 1914]. At the time of her death, all of the other members of the family, except a baby four months old were sick abed with bad colds which have since developed into pneumonia. Miss Koivisto was informed of the conditions at the home and understood that the Bergmans were in need of medial attendance and the services of a nurse. She decided to dismiss her school for a week and give her attentions to the stricken family. The children of the community were so notified. The school is No.23 of the unorganized district. When the Bergman family was first taken down with the sickness, Dr. Crowe of Virginia was called. He paid one visit to the family before Mrs. Bergman died, but did not return until Wednesday of last week, when he accompanied Humane Agent McKercher to the homesteader’s home. Neighbors had removed the body of Mrs. Bergman and had taken it to Sand Lake, twenty miles away, for burial. The baby [Hilda] was also taken to Sand Lake and placed in the care of relatives. At the request of the father of the children all the bedding which had been used by the mother was burned. It being presumed that the woman had been afflicted with a contagious disease. Humane Agent McKercher declares that he found Miss Kivisto taking and recording hourly temperatures of each member of the family now under her care. The young woman told him that although she had no training as a nurse she understood about some of their duties. The family is now under the care of Dr. Crowe. The father who has been dangerously ill is believed to have passed the critical stage and will recover. All of the children Mary 11; Hilja 9; George 8, John 5; and Albert 2, are expected to live. [Owen, was omitted in this account. Perhaps he was being taken care of by neighbors or relatives and was not at home.] The humane agent also found five sick children suffering from bad colds and grippe at the home of another homesteader, Don Makari [sic], two miles away. On his return to Cook yesterday he ordered new bedding and a few other supplies sent to the stricken Bergman family.